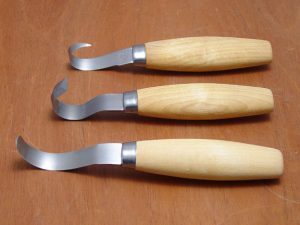 You have been going through some wood carving tools, and you are wondering what the hell a carved hook knife does in the whole carving business. If you are, then there is no doubt that you’re a novice. A carving knife is one of those tools that are the difference between a successful carver and a not so successful one. Morakniv Sweden is one of the companies that stay on the lips of carvers and carpenters. That means this carving knife is a quality product that will not disappoint you. However, several shortcomings accompany it. A net weight of 2.1 oz. That is approximately 59 g.
The handle is made from birch. Birch is widely known when it comes to the texture which is uniform and comfortable. The handle is tapered at both ends meaning that your grip is firmer. The blade is durable and reliable. It will not easily break when you are in the middle of something. It is an affordable piece – probably what many beginners like to hear. It does maintain its sharpness. For newbies, this something that comes out as unattractive to them. The rounded edge makes it challenging to sharpen it effectively. The product does not come with sheath meaning that the blade may lack adequate protection. To keep the blade in good shape, you will need to keep oiling it. Store the tool appropriately. Don’t store it in tool bag where it is easy for the blades to knock against each other. In that context, you might want to consider a toolbox where everything has its place. A sheath is probably a good idea. Get a good one and let your blade stay sheathed when not in use. As with all sharp tools, be careful how you handle the blade. You may think you are safe just because you have a curved knife on your hands. Far from it, this knife may do you considerable harm if you don’t deal with it as it is supposed. The curving strokes should be away from you. This ensures your body is not in the path of your carving. Be careful and do it the right way the first time. Some learning experiences are worth not having. Stay alert at all times when carving. If your mind seems to drift off your carving quite often, then it is time to call it a day. You are probably tired or hungry. Grab yourself something for your energy and resume your carving. Most carving accidents happen because the carver has a lot on his mind. Don’t assume that carving is something that will help you relax after running up and down the whole day. Keep all your senses on the carving. This includes your hearing, sight, feel and smell. If you do that, then you will notice if something is wrong and you will avoid getting some nasty nibs on the finger. One of the first things people see when doing their shopping is the price. The cheapest products are not always the best. Therefore, go for something that fits your budget but is not too cheap. Mind the quality of the product. The blade and the edge are some of the most critical components in carving tools. They determine how your work comes out. When it comes to doing your shopping, consider the material of the blade. You don’t want something that will break at the critical moment you are about to complete a masterpiece. Bad quality blades are also a health hazard. Injuring yourself with a breaking blade is easy. Morakniv hook knife is a decent choice for beginners. Its price is on the fair side, and its quality is not badly off. It is one of those tools that beginners, as well as, established carvers will find quite useful. The only downside is that you may need to keep sharpening. This can prove tiring and a total put off for beginners.